Amongst the ensuing chaos, Nate and Hermia, two victims of the new world order, are taken against their will to The Compound. Joined by eight other teenagers all chosen for a specific reason, Nate and Hermia are forced to train as assassins to overthrow the current president and make way for a new leader of the free world. Here, they learn to plan, fight, and most importantly... To survive. Except, despite the casual cruelty of their new existence, both Nate and Hermia, two very strong but very different people, begin to form fragile bonds within the group. But they soon realize their happiness is short lived... Because their training is just the beginning. A war awaits... Regardless of how ready or willing they may be. Sixty years ago, a solar flare reaped havoc on the Earth and it's inhabitants. Most of the population was decimated, and those left behind still continue in a fierce battle to rule over what remains. Hermia lives alone, a resilient urban warrior in a new society where only the determined survive. But when arriving home to her meager possessions, Hermia is captured and taken to The Compound along with nine other teenagers, including Nate. Nate should have been home on time, a guilty conscious weighs heavily on his mind. He arrives home to a household of slaughtered family members and a message containing nothing more than an address. But justice for his family had led to Nate being taken against his will, joining the other carefully selected teens awaiting further instructions at The Compound. Darria has amassed the team of ten teens to fight against a group of dangerous activists, simply known as The Cain. Their duty is to take down the current empire, the current President Collins who has vowed to clean up the apocalyptic ravaged streets, with the promise to form a new society and a stronger world while The Cain operate under the guise of fighting for democratic rights. The hand selected group of teens will live within the Compound, each day completing a new challenge aimed to hone their skills at combat. The savage program is overseen by a guard posted to each teen, they are taken to and from training under duress, and silenced if they dare question authority. The training is intense, emotions are heightened and fear drives the teens together and separates the group into factions. Nate finds solace in the company of Marina, a girl taken against her will. While Hermia finds herself gravitating towards Keeper Chase, keeping their brief rendezvous hidden. But Hermia is quick to push Chase away, her cold exterior hiding her inner turmoil of a past where abandonment has only made her more determined to survive. But these aren't any ordinary teens. Some have volunteered to join the fight to protect the President, while others just want to return home. But coming together is no coincidence, and it may take answers from The Cain to see what the group are truly fighting for. 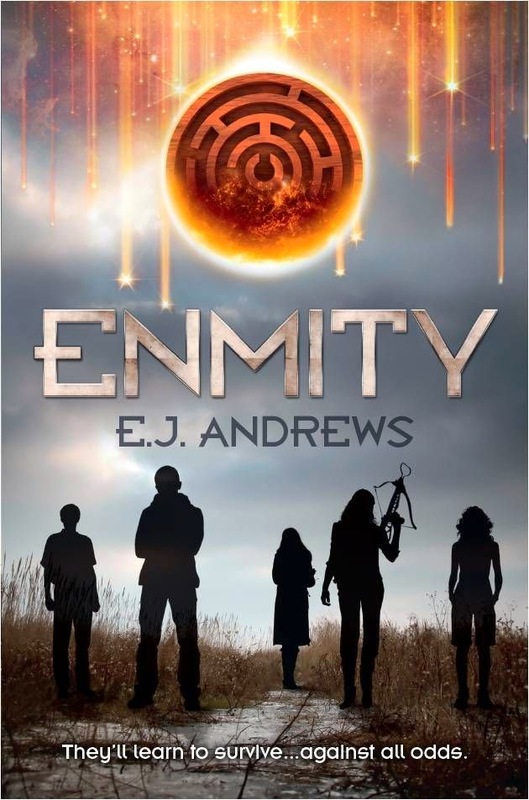 Enmity was a mix of The Hunger Games, a dash of Divergent and science fiction packaged in an action packed storyline where teens are trained to fight an enemy most couldn't care less about. It follows the story of both Nate and Hermia, told in dual points of view. Both were taken against their will to join eight other teens, some taken and some volunteering to train for a war against a brewing revolution. Nate is deemed as their leader, a young man with an imposing presence that is mourning the loss of his family. Hermia was on the verge of selling her body into a life of prostitution before she was snatched, but she's abrasive and isn't winning friends amongst the other teens. The two couldn't be more different, but the two share a common secret that neither of them knows about the other... Yet. I really enjoyed it. It was a short, sharp read that sucked me in and kept my attention. The storyline seems to have been inspired by many of the popular dystopian novels that many of us have on our shelves, but merged them into a brilliant little read. My only complaint (which I'm sure will be what lures most readers in) is that I wanted more action, more fighting and less romance. But there's no awkward love triangles in this one, a case of instant love in one case, but rather than having the two points of view merge into one romance, it strays from the usual. It was really refreshing. Take a chance with this one, it'll really surprise you. I can't wait to read this book, I am really looking forward to it. Great Review and the author feature was fun. Thanks Rochelle. I really enjoyed hosting E. J, and looking forward to seeing if you agree with her casting choices. I have this to read, not really sure why I have been putting it off...it sounds AWESOME. (Plus I'm loving the author's casting choice. ;) I'm a bit cautious of the comparisons to THG and Divergent, though. *sigh* EVERYTHING is compared to them these days and that's such a high bar to meet, but still. :) Can't wait to read it. It has aspects of both books mixed in, but you'll definitely see the differences. It's a quick read that I'm fairly certain is so it provides a backstory for greater things to come. It's perfect for teens even, really enjoyed it. It's a really entertaining read though isn't it, no useless storyline filler either. It takes aspects from all the big dystopian releases and rolls them into one. It just worked for me. Hope you're enjoying it as much as I did. I'm a sucker for a typical dystopian, just can't help myself. But this one is pretty good Joy, it's on Netgalley at the moment too, definitely give this one a go. That you all loved it as much as I did! It has to be my favourite book at the moment! !